WITH CLEAR-EYED GRACE, REFRESHING HONESTY, AND FLASHING WIT, WENDY LAWLESS TELLS THE TRUE STORY OF HER UNHINGED UPBRINGING— A DISJOINTED FAIRY TALE OF A CHILDHOOD IN CHAOS By the time Wendy Lawless turned seventeen, she’d known for quite some time that she didn’t have a normal mother. But that didn’t stop her from wanting one. . . . GEORGANN REA didn’t bake cookies or go to PTA meetings; she wore a mink coat and always had a lit Dunhill plugged into her cigarette holder. She went through men like Kleenex, and didn’t like dogs or children. Georgann had the ice queen beauty of a Hitchcock heroine and the cold heart to match. In “a searing memoir that reads like a novel” (Anne Korkeakivi, An Unexpected Guest), Wendy Lawless deftly charts the highs and lows of growing up with her younger sister in the shadow of an unstable, fabulously neglectful mother. Georgann, a real-life Holly Golightly who constantly reinvents herself as she trades up from trailer park to penthouse, suffers multiple nervous breakdowns and suicide attempts, while Wendy tries to hide the cracks in their fractured family from the rest of the world. 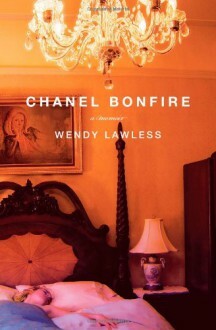 Chanel Bonfire depicts a childhood blazed through the refined aeries of the Dakota and the swinging town houses of London, while the girls’ beautiful but damned mother desperately searches for glamour and fulfillment. Ultimately, Wendy and her sister must choose between living their own lives and being their mother’s warden—the hardest, most painful, yet most important decision each of them will ever make.